It’s January. A good time to take stock and reflect on 2017. And for the Nintendo Switch in Japan, what a year it was. Throughout 2017, the Switch drew long (and sometimes hellish) lines. Even by the year’s end, when the Switch became more available, it still continued to post strong sales numbers. But, really, how good is the Switch doing? Previously, Kotaku posted sales comparisons with the PS4, another highly successful console in Japan. The Switch, however, isn’t just doing well, it’s doing exceedingly well. Heck, sellouts are still being reported this month (see below). 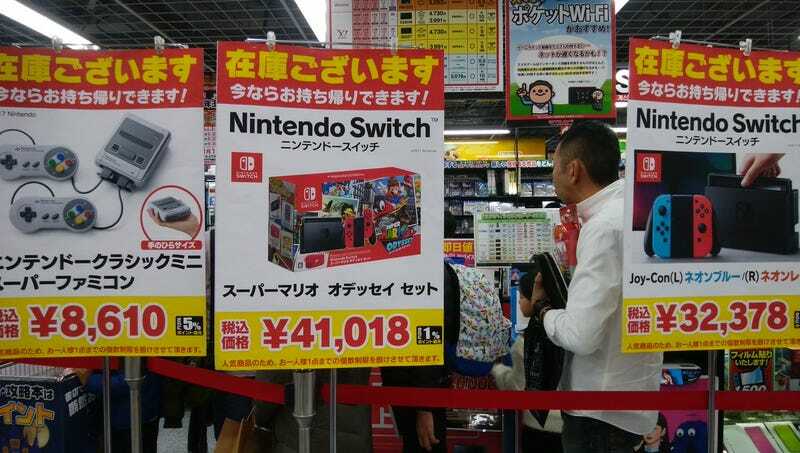 In Japan, Nintendo sold 3.4 million Switch consoles in 2017. Website Nintendo Soup notes that during the PS4's first year, Sony sold 920,000 consoles. Meaning? It looks like the Switch ended up outselling the PS4 three to one. Just check out how the Switch compares to the PS4 during each console’s first 44 weeks (the character 週 means “week”). As pointed out on Mutyun and 5ch, here’s a graph that shows how the Switch is doing compared to other consoles. The graph starts at 発売, which means “going on sale.” 1年後 means “one year later,” while 2年後 means “two years later” and so on. Damn, those Nintendo 3DS sales numbers are good. That’s over 23 million units. Here is the same data, but adjusted by year. It will be interesting to come back seven years later and see if the Switch is doing as well as the Nintendo 3DS.